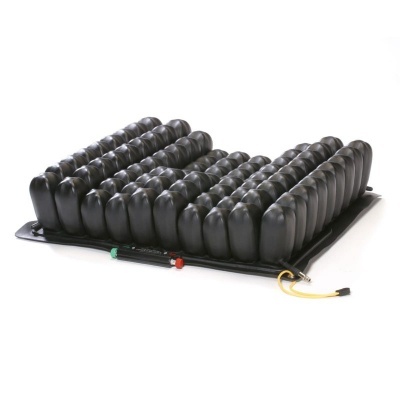 The Roho Contour Select Pressure Relief Cushion utilises ISOFLO Memory Control that provides exceptional support in high pressure areas by locking air into four compartments which stabilises the user and prevents friction. By intelligently remembering the shape of the body, the Contour Select Relief Cushion ensures comfort and relief, making it ideal for high risk pressure patients. Introducing ISOFLO Technology, the innovative, new design from Roho that intelligently allows pressure cushions to remember the shape of the body in order to provide stability and comfort. The ISOFLO memory control unit at the bottom of the cushion locks air into each of the four compartments of the cushion, which prevents side to side and front to back movement while reducing friction and reducing the injury risk. This support is ideal for reducing the risk of, and recovering from pressure sores that form after extensive pressure to soft tissue that then prevents blood from passing through. The air cells locked into the bottom of the cushion allow blood to flow, therefore enabling recovery and restricting the cause of pressure sores. 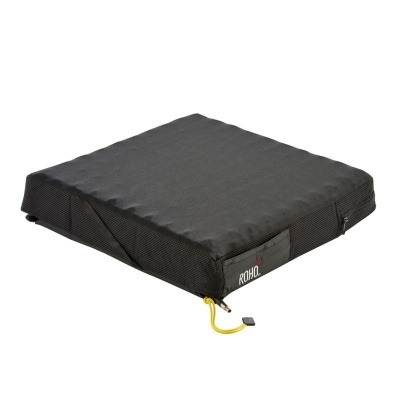 For anyone who struggles with mobility, providing a relief cushion that encourages integrity, positioning and stability can enhance day to day life. The Contour Select Cushion offers total postural support and positioning, ensuring that the pelvis is positioned in the back of the wheelchair which then centres the individual into the middle of the seat. This is supported by a breathable design that allows air molecules to pass in between the user and the cushion, preventing overheating and enabling recovery. This breathable design ensures coolness and comfort, while supplying the stability needed to continue the day with confidence. *This list of indications is for guidance only and does not constitute medical opinion. Please consult your GP, consultant or physiotherapist in order to obtain a medical opinion as to which pressure relief cushion is most suitable for your requirements before purchasing. The Roho Contour Select Pressure Relief Cushion is available in 13 different sizes that should suit most users. The measurements below are measured first across the width of the cushion from left to right, and then the depth of the cushion from front to back. 38cm x 46cm 15" x 18"
41cm x 38cm 16" x 15"
41cm x 51cm 16" x 20"
45cm x 51cm 18" x 16"
46cm x 46cm 18" x 18"
46cm x 51cm 18" x 20"
51cm x 41cm 20" x 16"
51cm x 46cm 20" x 18"
51cm x 51cm 20" x 20"